i prefer when she with short hair. easy to differentiate and she look cute if short hair. So many pretty pictures there. Tiffany always comes good on pics, she's so photogenic. Long hair vs short hair.. I dunno. I like her in both. Wtf yo, you get the witch hat stuff. I taek more of them school girl pictures! Those pictures I can't get enough Tiffany. quite a trick she have there. the balon move so fast from her left hand to her right hand. guys, slow down w/ tifeny cuteness. Or she has four, two in each hand, but makes two of them magically disappear? Whatever yo! She's cute and it's all that matters. Does anyone have the cartoon Tiffanys? The one where her eyes have no pupils or anything... Everyone in SNSD had their own little version of themselves in cartoon... it was cute. It's holiday looking... or was it Kissing You like? 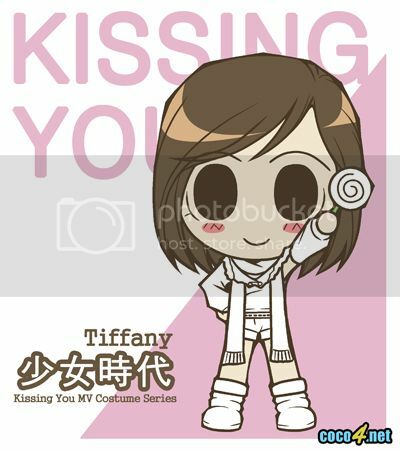 I don't know.. anyway, does anyone have cute cartoon Tiffany pictures? This one i got from the christmas pic. Which was to promote the christmas album? And Tiffany from the G'G album whatever it was. I don't think i have any more. Suddenly so much Tiffany love! We should be good fangirls and fanboys and post more Tifflove in here, shouldn't we?